Asthmatic situations with cough and labored breathing aggravated by pathogenic wind heat or pathogenic wind cold with preexisting accumulation of internal heat. May include fever or thirst, cough with fever or tracheitis, difficult breathing due to scarlet fever are some of the imbalances satisfied clients have used this product for. Gypsum fibrosum mineral, Prunus armeniaca seed, Cynanchum stauntoni rhizome, Glycyrrhiza uralensis root. - Shi gao, Xing ren, Bai qian, Gan cao. 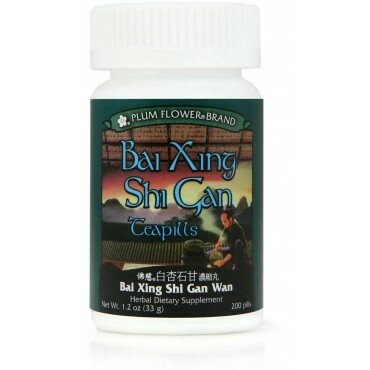 Shi gao/gypsum is a very cold medicinal and can injure the Spleen and Stomach Qi and/or Yang when taken for too long or in excessive amounts. Contraindicated for complaints due to excess cold or Qi deficiency. Contains tree nuts.